Aerolineas Argentinas has become Latin America"™s first airline to digitally empower its cabin crews and take the inflight passenger service to the next level with SITAONAIR"™s CrewTab. CrewTab digitally transforms cabin crew"™ preflight, inflight, and post-flight activities and their workflows by providing crew members with a complete, user-friendly mobile, and tablet application interface. 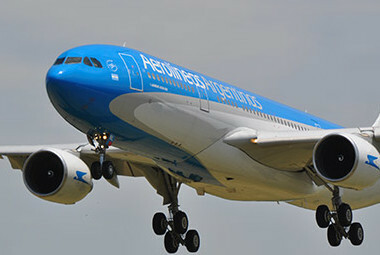 Through this, they can access key passenger profile details, spanning everything from special meal requests, to connecting flights. By replacing paper-based processes with interactive CrewTab dashboard, AR international crews can also access and update the airline"™s integrated back-end processes and information. In addition, CrewTab acts as a platform enabling AR flight pursers and cabin crew to streamline their advisory, documenting and reporting processes. Now equipped with this data on a single, touch pad display, AR crews can deliver a more personalized, proactive, and responsive service for airline customers on flights to Latin America, the U.S., Spain, and Italy. Argentina"™s flag carrier joins Virgin Australia and Philippine Airlines, among others, in harnessing this intuitive solution to advance their passenger experience offer.